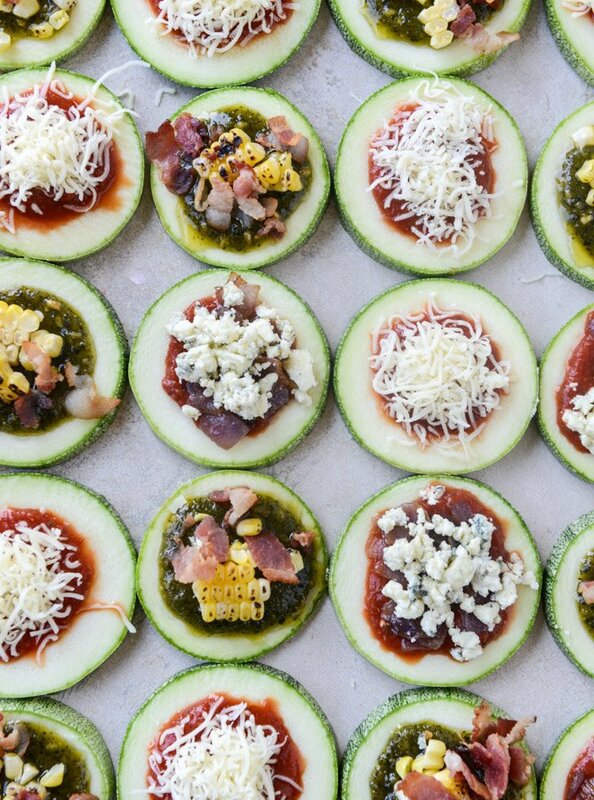 Mini Zucchini Pizzas, 3 Ways. Oh my gosh. 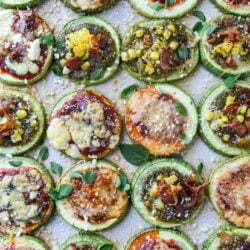 I’m in love with mini zucchini pizzas and I’m going to shout it from the rooftops. I’m in love with a VEGETABLE! I mean, yeah, maybe it’s kind of covered in lots of cheese. And bacon. And pesto. And grilled corn. I was originally saving this recipe for late august, but after posting it on snapchat (you can find me at howsweeteats), thousands of you screenshotted the snaps and asked WHAT the heck was on my zucchini. I’ll be the first to admit that little zucchini pizzas probably aren’t that unique, and I was thisclose to throwing some mini pepperoni on mine. That would be delish. But at the last minute, I tossed that pep to the side and decided to make a variety of my favorite flavors. Because I get extremely bored, like SO bored that I can’t even finish a meal without getting bored, I had to make three different kinds. Okay, I know, that’s fairly disgusting (the bordem part, obviously not the variety part) and untrue, but if there WAS such a thing as getting bored halfway through your meal, I would be the one to do it. Joy to live with. That’s me! Zucchini always reminds me of summer in the most cliché way. My mom would make pan-fried zucchini rounds and cover them in a parmesan cheese shower before serving them to use on super hot summer nights. It was one of the only times I willingly ate vegetables as a kid and actually looked FORWARD to eating vegetables. You couldn’t even find me with carrot or celery sticks, cherry tomatoes or iceberg lettuce. But come August, you could always find me with some crispy, crunchy zucchini rounds. I can still taste them to this day. This summer, I’m going equally as nuts for zucchini, but in a surprisingly… simple way. Not so much simple, like eating it straight from the garden simple, but simple as in I’m not covering it with breadcrumbs and frying it simple. I’ve been making zucchini lasagna roll-ups once a week and we all go crazy over them. I’ve also been spiralizing so often, if only because it’s fun. My local farm labeled this pretty zucchini as Mediterranean zucchini, but a quick search on the kitchn told me it’s also (or otherwise) called cousa squash. It tastes just like classic green zucchini but it seemed to have fewer seeds? Maybe be a touch sweeter? I don’t know but I liked it. Boom. So here’s what we’re doing!! Pesto, grilled corn and bacon. Oh my gosh. The flavor here is UNREEEEAL. I added just a touch of cheese but it isn’t even necessary. You will love it without the cheese. Next up, caramelized red onion and blue cheese. This one practically made my face explode it tasted so wonderful. I used some classic marinara for the sauce on here and while that’s rare for me, it worked perfectly with the blue cheese. Ugh. So good I hate it. Finally, a classic little marinara and fontina with lots of herbs. The key to the cheese on here is to use the fine side of your grater – as long as you’re using skinnier shreds of cheese, it will melt perfectly and stay on the zucchini round. Now tell me: what toppings are you going to do?! I can’t even WAIT to hear. 1/2 cup pesto, I used a delallo open pesto I had here, but also use this arugula one! Preheat the oven to 375 degrees F. Line a baking sheet with parchment paper or foil. Slice your zucchini into at least 1/2 inch rounds. Any thinner and they will get super liquidy and mushy under the toppings! Place the zucchini rounds on the sheet. Depending on how large they are, you might need two baking sheets. Assemble your pizzas! Spread the rounds with either marinara or pesto. Cover the pesto ones with the grilled corn and bacon. Alternate the marinara ones with the blue cheese and caramelized onions and the grated fontina and italian seasoning. Bake the rounds for 15 to 20 minutes, or until the cheese is bubbling and golden. Remove the rounds from the oven and sprinkle with the parmesan cheese and the fresh oregano and basil. To make the caramelized onions, heat a saucepan over medium-low heat and add the butter. Stir in the onions and toss. Stir in the sugar and salt. Cook until the onions start to caramelize, about 10 to 15 minutes, stirring often so they don’t burn. You might have to turn the heat all the way down. And with the sugar, they will caramelize quicker than usual! These are so cute and look delicious!! Do you follow a specific recipe for the zucchini lasagne roll ups you mentioned?? 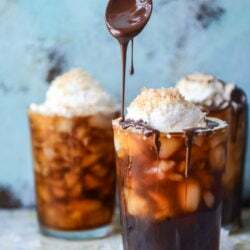 Would love to make those too. Thanks! i haven’t been, but i’m going to test it a couple more times and share it here too! right now i’m just wrapping some ricotta and parmesan up in zucchini slices and pouring sauce over top! Yeah, okay these could not be any cuter!! I love any recipe that makes you forget your eating all the healthy goodness of veggies :) Will be trying these ASAP – what a fun dinner! yes, it’s a great starter! hehe. My kiddos love to put their own favorite toppings on pizza so this is perfect! They will have a ton of fun making these! I am OBSESSED with this idea. That is all. Also, dreaming of a BBQ chicken mini zucchini pizza. Or buffalo chicken. ummm yes both of those combos are on my mind too! i can’t even imagine the deliciousness you cook up at work! I’m a fan of mini pizza’s in any form! The idea od adding pesto and bacon and cheese among other ingredients to this sounds beyond good! No wonder people were screen shotting your snaps so much! zuke ‘za… bahahah. that sounds so good! OMG! The fact that bacon happened just took this idea from “I might need to try that” to “MUST HAVE NOW!” These look killer! My mom used to cook zucchini that same way in the summertime! We always planted WAYYYY too much zucchini in our garden, so we ate it nearly every night, but it never got old. These pizzas are revolutionary! I’m definitely trying this!! Okay, I’ve heard of these before and thought, eh…but now after reading this article and seeing the pics, I’m thinkin’…okay, yeah….I can do this! Hubby is into veggies now after 5 years together! We are starting to harvest from our first full garden and have a nice small zuke left from the first picking….IT could happen!!! SOON! I’ve been wanting to make these forever! I was thinking mozzarella and those adorable tiny pepperoni dots with a tiny chunk of grilled pineapple on each one. I’m the world’s biggest sucker for sweet & salty! This was brilliant inspiration. Had this last night and my baby loved it too.